"Hello, I'd like to sit and just have some wine with my..."
I hesitated. 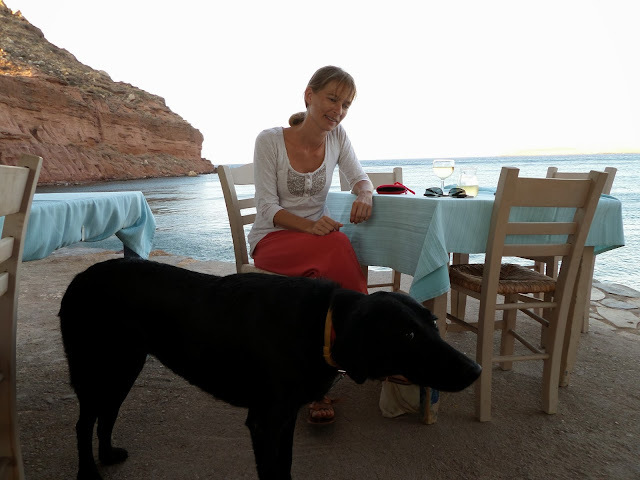 I wasn't sure if I was asking if it was ok to just have a drink rather than a meal, or whether it was ok for me to bring my dog Sage in to the taverna. "With your friend", said the waiter, finishing my sentence "Of course, have a seat!" I've always loved this place. 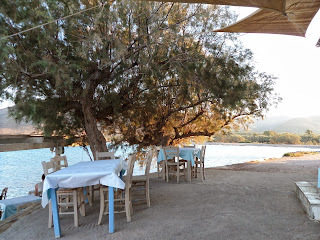 I've been coming to the Seafood Restaurant at the end of Xiona Beach since my first season working at the archaeological site at Palaikastro, ten years ago. I love the views from the terrace that is so close to the sea it is practically floating. I love it at the end of the day, when the light changes and the entire bay from Kastri round almost as far as Zakros, glows bright yellow, changes into pink, and finally darkens. I love it that, for the moment, there is no development on this coastline, just rock and sea and the occasional goat. In the last three years, I have been there several times with Sage. The owners and staff are always very welcoming. They didn't even complain when our girls (on a visit with Sage's friend Mayia) were sitting right in the middle of the steps, blocking the way and sniffing at staff carrying trays of food. 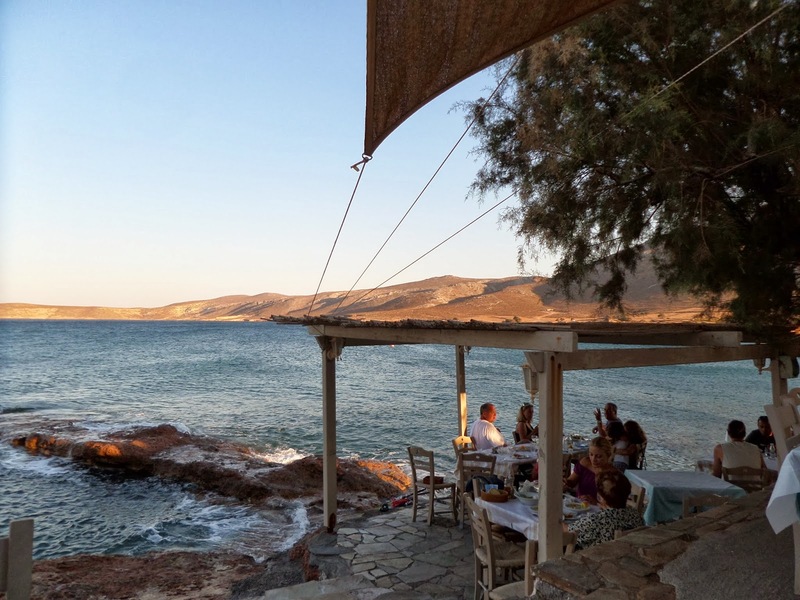 Prices at the Seafood Restaurant Xiona are quite reasonable, especially considering that a lot of the menu is freshly caught fish, and that it has about the most fantastic location in the whole of the Itanos District. You can get a plate of small fried fish for 7 or 8 Euros, as well as various mezedes such as stuffed vine leaves and fresh salads. Prices go to about 15-20 Euros for a portion of grilled fresh fish. It is mostly the atmosphere that draws me back there, year after year. I often feel a bit awkward going to sit in a taverna or cafe with Sage. I feel like everyone is looking at me, thinking I am crazy. I worry that we are in the way, that people will complain. That's why I loved it when the waiter described Sage as my "friend" rather than my "dog". They made me feel like it was quite acceptable to sit with Sage, enjoying the view and a glass of wine, after a walk around the coast. This is just chance, of course, but all the customers on this particular evening, this summer, were so friendly to Sage. There were children who couldn't stop coming over to stroke and play with her. They told me their family was just in the process of choosing a dog. 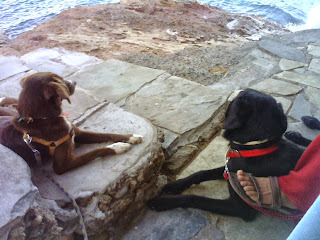 There was a group of foreign tourists who came over and helped me take photos, and petted Sage. And there was an Athenian woman who, while stroking Sage, told me about her difficult journey from Athens via ferry... to holiday with her cat!